Why do we get tattoos? Sure, they look pretty, but so do things that don’t hurt and/or cost so much. I’ve just returned from a 5 hour tattoo appointment. I have many tattoos, but until today, I only had one that took multiple sessions. I don’t like pain, so I can’t sit for very long. But I willingly went down to see my tattoo artist, requested that he repeatedly stab my entire lower leg with an electric paintbrush for hours on end, and then paid him for it. Why? There are so many other things that my hard-earned cash could buy that don’t involve masochism. Actually, I should specify. I’m not masochistic, since I do not enjoy being in pain atall. AT ALL. If you’ve never had a tattoo, allow me to explain. Imagine a cat scratching you. Mildly annoying, but you can deal with it, right? (Unless you’re a hemophiliac, in which case DO NOT GET A TATTOO.) Now imagine that same cat scratching you over and over and over again in the same place. For hours. Sometimes in ridiculous places. Of course different people have different tolerances for pain, and there are parts of the body that are more painful to get scratched or tattooed than others (this varies person to person too), but it’s the best description I have thought of in the 15 or so years that I have been putting myself through this. Luckily, the pain is temporary while the resulting artwork lasts a lifetime. So, the longer you sit for a tattoo, the more it hurts. This is exactly why the majority of my ink (13/15, unless I’m miscounting – which is entirely possible) has been completed in 2.5 hours or less. I know what my pain tolerance is, and I find designs that can be accomplished in this time. Until recently. I had some hairbrained idea to devote a large portion of my body to visually represent my love of the outdoors in an homage to both my hometown and my current home. I wanted a new work of art though – actual, award winning, beautiful art that both my artist and I would proudly show off, and that would make random passersby’s jaws drop. Brian was excited when I told him my plan. I was excited that he was excited. Until today. I mentioned at the beginning of this post that I was there for 5 hours, yet astute readers will remember me saying I can only sit for 2.5 for a tattoo. What were we doing for the rest of that time? Planning out this opus, with markers. I loved that part, by the way. Someone could draw on me with markers all day long and I would be as happy as a rainbowed clam. I even traced my progress via instagram: Step 1: draw the parameters. Step 2: Draw the trees. Step 2.5: Draw the mountains, and figure out where the faerie (des’ first tattoo!) will fit in. Step 3: Make it even cooler with colors and depth! Step 5: Complete Phase 1. Repeat once per month, as required, until finished. About 2 hours in, I stopped trying to actually look at my leg to see the progress, and flat out asked how much more there would be. Brian and I both knew going in that we wouldn’t finish it tonight, so there was an unspoken stopping point. In fact, he wanted to go over a few more spots again, but I pleaded with him to wait until next time. Yes, I know that will make it take more sessions. I don’t care. I can’t handle this pain anymore! I apologized for being such a wuss, to which he replied with a laugh and the admission that he’s the same way. I asked if he had any tricks, since all the ones I know of (namely alcohol and/or painkillers) hinder the process by thinning your blood. His trick? One or two of the airplane-sized bottles of whiskey. Won’t that thin the blood, I asked? Not that little amount – it’s enough to take the edge off, but not fully complicate things. Just don’t binge drink the night before, which is not a problem for me anyway. So I’m going to try a nip of the clear liquid next time. In exactly a month from today. I’ll let you know how it goes. You may remember when I got my mini cooper a while back. Not long after acquiring said car, I needed to replace the power steering pump. It was a known defect in certain cars, and though it worked most of the time, it was not fun to be driving when suddenly my power steering went out. Luckily, it was tax time, so Uncle Sam gave me back some of my money and I was able to get this fixed. Not long after that, like less than a month, mini sent out a recall notice. They stated specifically that if we had already replaced the part, they would issue a reimbursement. I got all my paperwork together and sent it in on June 5, 2013. I was told to wait 6-8 weeks. So I waited. And heard nothing. I gave them a call, just to make sure they received everything. They had, and Good News! They were reimbursing me the full amount, with parts and labor came to almost $1000. So that was excellent. Also, by this time I had a new address, so I gave them that so there would be no confusion. Then I continued to wait, already making plans on what to do with the money once I got it back. Every 3-4 weeks or so, I would call mini again to find out the status. Every time I called, I had to verify all my personal info, including the address (which I had changed, remember). This is an important detail to stow away for later. Every time I called, they promised me a different release date for the check. First it was the original 6-8 weeks. Then it was “by the end of the month.” Then, the end of the year. Then, they just stopped giving me estimates. A few times, they couldn’t find my records at all, which was hilarious and maddening all at the same time. Lucky for everyone involved, I myself had kept detailed records. When I gave them this information, my “case” was finally found again. I even asked to speak with supervisors and managers. Once I was transferred to the “I want to be financed for a brand new BMW*, please” representative. That was just all kinds of wrong. They are supposed to pay me! Eventually I got the news that an actual physical check had been cut in my name. So I checked the mail every day, and continued to wait. After another month or so, I called them again. Much back and forth led to the discovery that my mystery check had been sent to my old address. You know, the one I changed about a month into this whole ordeal, and had to verify with every biweekly phone call? So I re-gave them my new address, though at this point I’ve lived here for about 9 months. Until today, Lo! A Fedex envelope that required a signature. The return address said BMW. I was almost in tears as I opened it. Did I really get my check, after literally 50 weeks? I had almost started to believe it was a myth. My elation was cut short, however, as I noticed several pages attached to my check. Did.. did they send me extra money? No. They sent me 5 other people’s checks paperclipped to my own. Some goon at the BMW head office was handed a stack of checks, instructed to mail them, and didn’t bother to see if they were all going to the same place. Mine happened to be on top, so they all came to me. Interesting side note, they spelled my city incorrectly. Apparently I put in additional syllables and letters when I say my address. Or someone doesn’t bother to double check anything. Just one more thing that may have been able to speed the process up. My own check went immediately into the bank, before there was any case of BMW calling backsies. I was tempted to call (or at least reply to the email) to let them know of their error, but then I figured that if I had fought this long and hard for my check, these people probably have too. If I tell BMW they effed up, they’ll cancel the checks and those poor bastards will have to start the process over. So, I’m going to write each person a little note explaining what happened, and send the checks out myself. Maybe there will be some karma, or maybe these people will flip out and call BMW themselves. Either way, my battle is finally over. *BMW is the parent company of mini. 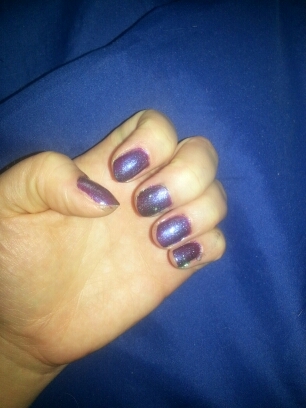 Sally Hansen’s “Purple Potion” underneath China Glaze’s “Mistletoe Kisses” give a nice shimmer.